Mortgage Reducing Term Takaful, commonly known as MRTT, is an Islamic alternative to Mortgage Reducing Term Assurance, commonly known as MRTA. The latter is a type of conventional life insurance mainly designed for homeowners to secure their outstanding loans. It is not an overstatement to say that MRTT is an initiative to provide a Shari'ah-compliant substitute for conventional insurance. It can be argued that offering MRTT enhances the economy, shields from hazards, and provides comfort for the families of the participants. However, offering MRTT for the borrowers of conventional housing loans poses Shari'ah issues regarding the Shari'ah compliance of such coverage. 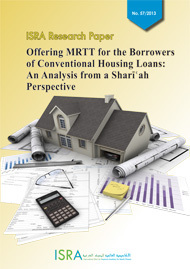 This research provides a Shari'ah analysis of MRTT coverage for conventional housing loans, an issue that has posed unresolved and pressing Shari'ah issues in the Takaful industry for about a decade. The method used is primarily textual analysis of the primary sources of the Shari'ah, namely the Qur’Én and the Sunnah, along with secondary materials such as the resolutions of the SAC of BNM, AAOIFI’s Shari'ah Standards, resolutions of the Fiqh Academy of the Muslim World League, books, journal articles and conference proceedings. The study includes critical analysis of the diverse views of contemporary scholars, including Shari'ah bodies and individuals, on the permissibility and impermissibility of MRTT coverage for conventional loans. It addresses strengths and weaknesses of the arguments of each view in terms of their relevance to the subject. This research finds MRTT to be tailor-made for the repayment of the outstanding debt that results from financing provided by an Islamic or conventional bank. Thus, if MRTT is offered to cover a conventional housing loan it becomes impermissible because it involves an element of riba and possibly encourages promotion of riba-based loan. It also finds a link between the MRTT contractual agreement and the conventional loan contract. Therefore, the separation of the two contracts is an unrealistic claim. In order to invoke necessity (darurah/ hajah muta'ayyinah) as prescribed in the Shari'ah regarding the plight of conventional bank customers who have received conventional housing loans, the necessity should be proved beyond doubt. Thus, a transaction structured on the basis of the rule of necessity should not be held permanent. MRTT, apart from its key role in economic enhancement and public easement, is an Islamic finance product. Thus, MRTT coverage for Islamic financing is entirely appropriate, but the same cannot be said about its use for conventional housing customers. Refinancing outstanding conventional debts using Islamic finance would be a better option if possible. This is to preserve the mandate of the Takaful industry, which includes the elimination of riba-related activities. It is argued that, if MRTT were to be given to cover a conventional housing loan under the principle of darurah (necessity) or hajah muta'ayyinah (actual need), it should cover only the principal amount, and the Takaful benefit should be paid to the family of the participant. If MRTT is offered to cover conventional housing loans, the practice should be limited to a specific timeframe in order to avoid long-term negative effects on Islamic finance products. Better still; an individual family Takaful package can be given to conventional customers who have taken housing loans if the customers wish to take a Takaful policy, as long as the policy is not linked to any outstanding loan. Public awareness needs to be raised, particularly among Muslims, regarding the specific affinity of MRTT and other Takaful plans with Islamic financing. The regulatory body should strive to determine the extent of darurah (necessity) that exists, taking into account both the needs of the Takaful industry and the Islamic banking sector. If it decides to continue permitting MRTT coverage for conventional housing loans, it should set a time-frame for how long this permission should last.